Sewing is my only hobby. I like to read, but I generally prefer to sew, and for me going to the gym is mainly for my mental health (and trim arms…). Unlike Kbenco, Sew2Pro, Canadian Stephanie and Scruffy Badger, I don’t really like running. Our home is pet free – although I love the russet dachshunds that sneak into Anne‘s posts – and our “garden” consists of a few baskets and pots. Having cooked on an almost industrial scale when the family were young I more or less leave food to my husband, or the professionals. However I think most of these things “go” quite well with sewing. But tatooing. 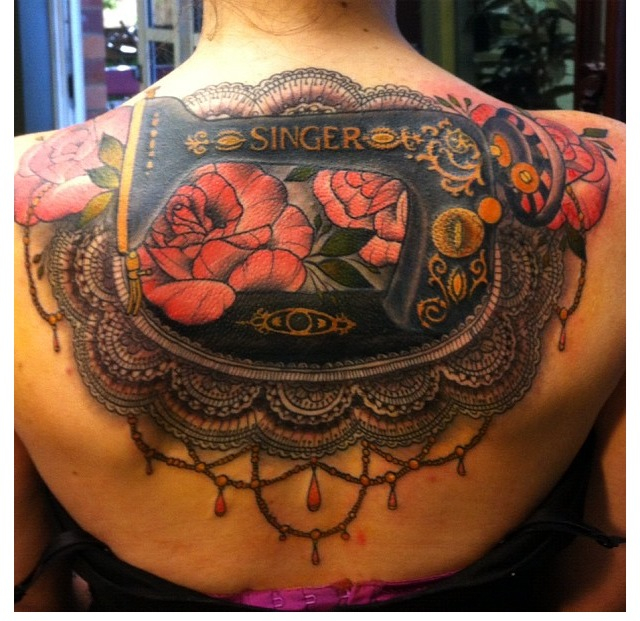 Have you noticed a link between sewing, blogging and tattoos? I don’t get it. Needles? Design? Colour? Something addictive about it? Maybe masochism is amongst us. Anyway this is just to introduce you to this phenomenon, much of it very detailed, very colourful and generally nostalgic for a type of sewing machine our mothers or grandmothers may have used. These motifs appear again and again – scissors, pins, tapes and buttons. The look seems to be “modern retro”, with dyed hair, defined waists, petticoats and lots of black fabric. There is a Flickr group with lots more photographs, if you are interested. On reflection I am wondering if the tatooed are attracted to sewing. Bespoke gowns are what goes with ornate tattoos, perhaps, rather than the other way around. Have you got some scissors on your bosom, a button on your belly or a tape measure round your waist? I am very anti-tattoo, which is hard since most of my friends have them! I love that Singer tattoo at top, but I’m not sold on the overall aesthetic. It feels dated to me now. I love that NOT having tattoos makes me stand out now. Years ago I wanted a bluebird on my shoulder but was warned that as I got older it would smudge into a blue blob. My daughter has S made up of stars on her back. I was not too pleased when she had it done and now a few years later she regrets it. I have a tattoo- it was my ‘nearly 40 and I always wanted one’ mini rebellion. Of course, now they’re ten a penny. Mine isn’t sewing related, I think that’s a bit lame [sorry everyone] and I don’t like twee tattoos, they’re the visual equivalent of Christian Rock [sorry everyone lol]. Mine’s a dragon, and he needs topping up now as 15 years on, he’s a bit smudgy. I’m often alarmed by WHERE women have their tattoos as well…they sag! Ha ha! One of the best tattoos I have ever seen was a very small, yellow, Beetle car on a lady’s bottom. I spotted it in the gym changing room and really wanted to say something but I felt it was “inappropriate”. Seeing tattoos on almost every bride from huge wings across their back to snakes crawling up their legs…it just creeps me out. Some of my older brides in their 60’s have such sagging skin that the shapes have really distorted and colors faded that they look more like a bruise than a motif. 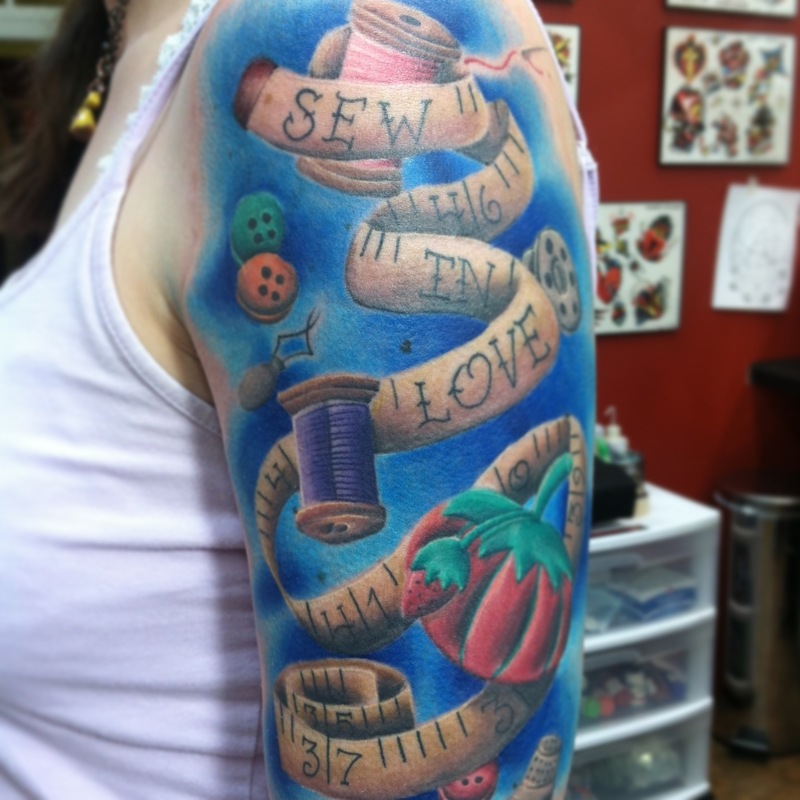 Maybe the fascination with sewing tattoos is the needles and pain. After a day of pinning up hems and zippers my fingers resemble a pincushion and can be swollen and red like a fresh tattoo. There have also been a correlation between the pain endured and the reaction of the body by producing endorphins and a “high” much like the feeling when a wedding gown is finished and paid for…now that is a real high! So, no, this girl does not need a tattoo to promote or celebrate sewing…my hands tell the story but the latest photos of sewing tattoos covering such large areas of the body are staggering! Thank you, Kate, for bringing this to our attention…what beautiful art! I laughed at “button on your belly”! I’m sure someone out there must have one tattooed on! I’ve often considered one, there were plenty of people who had them in Art College. I’ve just never seen one I liked enough to look at for the rest of my life! Something about injecting dyes under my skin just doesn’t sit well with me. Nor does a permanent image that will fade and sag over time. I can’t even imagine what I would have picked in my twenties but I’m 100% sure it would not sit well with me today. Just like fashion, it all gets dated. But I do love sewing as a passion and reading and seeing what others are making and being inspired by blogs like your Kate. I don’t have any tattoos myself but my sister-in-law, who is very creative, has a tattoo of a sewing machine bobbin in it’s case on her inner forearm – quite large. I’m one of a few people who actually know what it supposed to be. I do like the bottom image, across the chest and down the arms but that skin isn’t always going to look so youthful. While I do appreciate the artwork involved in tattoos it just isn’t for me. Not a fan of pain. I do remember wanting a Welsh dragon, but his fierce form would have devolved into a pregnant belly by now. They age right along with us. I do appreciate the artwork involved sometimes, but tattoos really are distracting to me. Sewists create beautiful garments and all I can see is the tattoo, which sometimes is quite jarring if a print fabric is involved. I would much rather admire the artwork of the garment and appreciate the talent it took to create it. My daughters claim my hatred of tattoos is pathological. I call it generational. Only bikies and criminals wore Tatts when I was growing up. I’m not a fan of tattoos. No, actually it’s stronger than that – I actively dislike the concept, even though some of the art is beautiful. Like Jean, I often find the tattoos distracting when a garment is being modelled, particularly if a large area is involved. I do have hobbies other than sewing and it can be difficult fitting everything in, so I don’t do as much sewing as I’d like, especially now the garden is growing out of control! When I was 22 and swimming daily (now 53 still swimming) , I saw a maybe 60 yo woman with tattoos and that was enough for life. They do not wear well. When my son was about 7 and a little bit interested in them and tattoos started being on everyone, I asked him about Thomas the Tank Engine. He said “lame”. I reminded him that he though Thomas was the absolute pinnacle of cool and he laughed and remembered.. “but not now Mum”. I told him to always think of that if he ever thought to get a tattoo….. your tastes change more often than not. I have only seen one that I liked (not enough to ever get one… heck I still only have one hole in each ear!) and it was a little etherial, foggy looking forest on a girls arm… it looked like real art not tattoo art if that makes sense. To each their own. I’m with Caroline, I like not having a tattoo. We will surely be the exception before long. However I do appreciate the artwork and skill involved. I’d rather see that style of folk-art on a wearable item that can be removed, maybe embroidered or painted onto something. In fact, that’s not a bad idea………. Yes! I am quite attracted to the art work (although I think it will date), although I dislike tattoos in general. I don’t like tatoos in general, despite finding some of the design interesting. I’m put off by a. association with pain b. age related questions – wrinkles, sags, thinning skin and what seems to me to be an idiotic way of making an essential organ potentially more fragile c. aesthetics – the look only works with some clothes imo, with others it jars d. being old enough to remember tatoos as being associated with poor life choices. 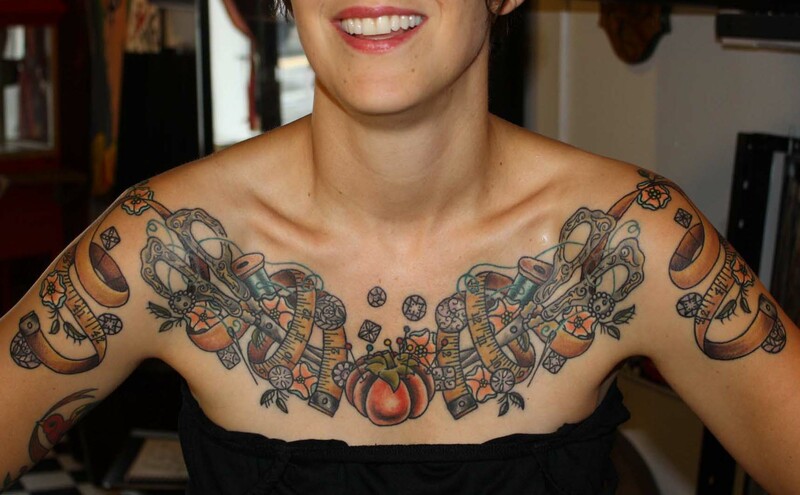 But if someone chooses to decorate their body like this – its their choice, and not my concern. I completely agree with this sentiment Jay. I enjoyed reading this and appreciate the sewing tattoos. Keep going back and fourth about a tattoo but it would have to mean something. Loved the detail in the tattoos and the colours.